Asbestosis is a lung disease that occurs from breathing in asbestos fibers. Breathing in asbestos fibers can cause scar tissue (fibrosis) to form inside the lung. Scarred lung tissue does not expand and contract normally. How severe the disease is depends on how long the person was exposed to asbestos and the amount that was breathed in. Often, the symptoms aren't noticed for 20 years or more after the asbestos exposure. Asbestos fibers were commonly used in construction before 1975. Asbestos exposure occurred in asbestos mining and milling, construction, fireproofing, and other industries. Families of asbestos workers can also be exposed from particles brought home on the worker's clothing. Workers today are less likely to get asbestos-related diseases because of government regulations. Cigarette smoking increases the risk of developing asbestos-related diseases. When listening to the chest with a stethoscope, the provider may hear crackling sounds called rales. There is no cure. Stopping exposure to asbestos is essential. To ease symptoms, drainage and chest percussion can help remove fluids from the lungs. The doctor may prescribe aerosol medicines to thin lung fluids. People with this condition may need to receive oxygen by mask or by a plastic piece that fits into the nostrils. Certain people may need a lung transplant. You can ease the stress of this illness by joining a lung support group. Sharing with others who have common experiences and problems can help you not feel alone. Outcome depends on the amount of asbestos you were exposed to and how long you were exposed. People who develop malignant mesothelioma tend to have a poor outcome. Call your provider if you suspect that you have been exposed to asbestos and you have breathing problems. Having asbestosis makes it easier for you to develop lung infections. Talk to your provider about getting the flu and pneumonia vaccines. If you've been diagnosed with asbestosis, call your provider right away if you develop a cough, shortness of breath, fever, or other signs of a lung infection, especially if you think you have the flu. Since your lungs are already damaged, it's very important to have the infection treated right away. 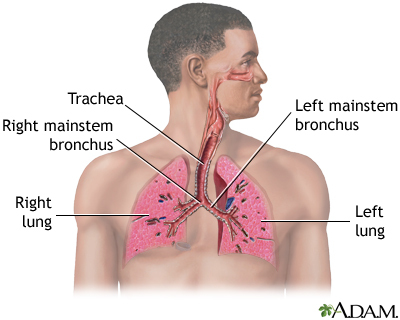 This will prevent breathing problems from becoming severe, as well as further damage to your lungs. In people who have been exposed to asbestos for more than 10 years, screening with a chest x-ray every 3 to 5 years may detect asbestos-related diseases early. Stopping cigarette smoking can greatly reduce the risk of asbestos-related lung cancer. Cowie RL, Becklake MR. Pneumoconioses. In: Broaddus VC, Mason RJ, Ernst JD, et al, eds. Murray and Nadel's Textbook of Respiratory Medicine. 6th ed. Philadelphia, PA: Elsevier Saunders; 2016:chap 73. Tarlo SM. Occupational lung disease. In: Goldman L, Schafer AI, eds. Goldman-Cecil Medicine. 25th ed. Philadelphia, PA: Elsevier Saunders; 2016:chap 93.